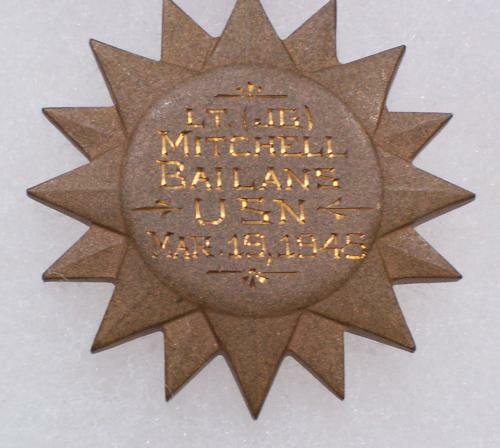 LTJG Mitchell Bailans was from Claremont, NH. He enlisted in the regular Navy in June of 1938, extended his enlistment in June 1942 and was appointed Ensign October 26, 1943. He trained at Pensacola. His service record accompanies this group. He was in VB 9 on Yorktown when they attacked the Japanese Islands of Kyushu and Honshu in early March. He was awarded the Air Medal for that action. On March 23, 1945, LTJG Bailans was hit by enemy anti-aircraft fire on a mission in preparation for the Okinawa invasion. His plane crashed on Okinawa Shima, Nansel Shoto. His remains were not recovered. During this time he was flying the Avenger torpedo bomber. 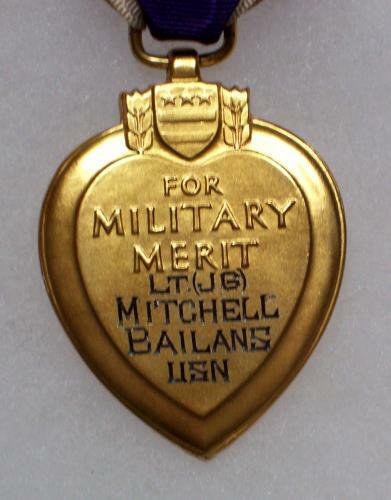 Included in this group, are Bailans' officially engraved Type 1 posthumous Purple Heart plus Air Medal. Also included, are photographs of him in flying gear and original newspaper articles about his awards and death. 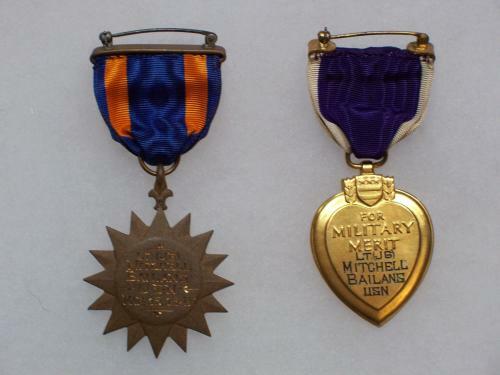 His Navy Air Medal comes with its original short titled case and the Purple Heart with its original purple coffin case. Accompanying the group is a small book entitled "Wing Tips" 1943 NAS Pensacola. His Air Medal Citation is as follows: "For distinguishing himself by meritorious acts while participating in an aerial flight in operations against the enemy on the Japanese homeland on 19 March, 1945. As pilot of a carrier based dive bombing plane he attacked the Kure Naval Air Depot, obtaining direct hits on hangers and installations. The attack was made in the face of intense antiaircraft fire. His skill and courage were at all times in keeping with the highest traditions of the United States Naval Service" This is copied from his award card for the medal.